I'm not very big on watching the Academy Awards these days, so I planned an enjoyable afternoon and evening watching some "old" movies instead! 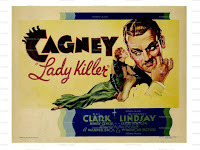 First up: LADY KILLER, my second James Cagney pre-Code of the week. This story of a mobster turned movie star is grand fun. 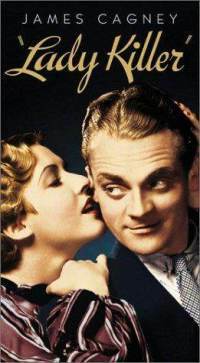 Cagney plays Dan Quigley, who starts out as a movie theater usher, then becomes involved with a gang which uses Myra Gale (Mae Clarke) to hook suckers into gambling. After the gang escalates their criminality to robbing the wealthy, things get hot and they all head west. Abandoned by the gang when he's arrested while on the run in California, Quigley gets out of jail and lucks into work as a movie extra. Quigley quickly works his way up the ranks and becomes a leading man -- complete with pencil-thin mustache! -- working opposite lovely Lois Underwood (Margaret Lindsay). And then the gang comes calling, promising to make big trouble for Quigley and his new career. This is a fast-moving, entertaining film which includes some amusing make-believe peeks at the movie business. Cagney and Clarke had previously shared a famous scene in THE PUBLIC ENEMY (1931), and the movie even references that with a joke about grapefruit! This is also the film in which Cagney rather infamously drags Clarke by the hair when she refuses to leave his apartment. 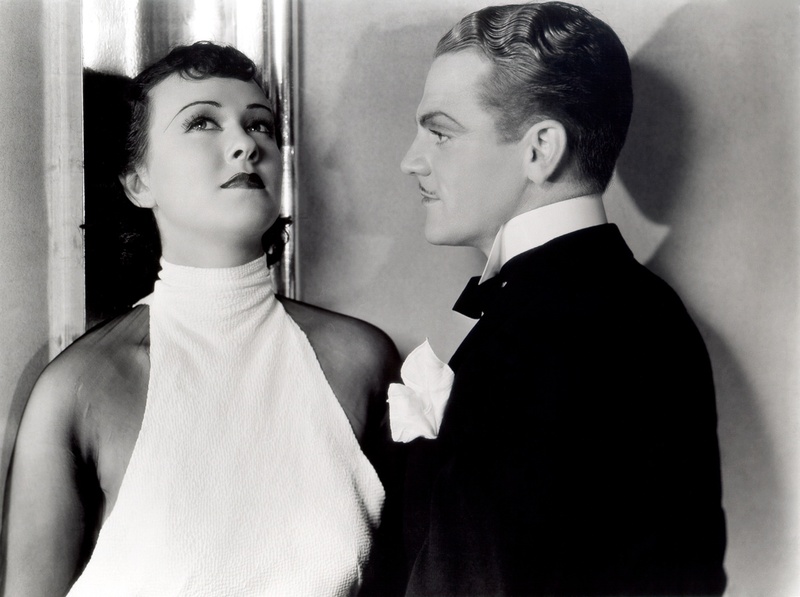 Cagney also played a crook in the recently seen BLONDE CRAZY (1931), but LADY KILLER is much lighter in tone. Quigley enjoys working in the movie business and leaves his old ways in the past, the conflict arising when the ol' gang blackmail him and then frame him for robberies of the homes of fellow actors. The movie was shot in black and white by Tony Gaudio, from a screenplay by Lillie Hayward and Ben Markson. The film runs 76 minutes. The supporting cast includes Douglass Dumbrille, Leslie Fenton, Henry O'Neill, Raymond Hatton, Robert Elliott, and George Chandler. See if you can spot Dennis O'Keefe as an extra in the casino! 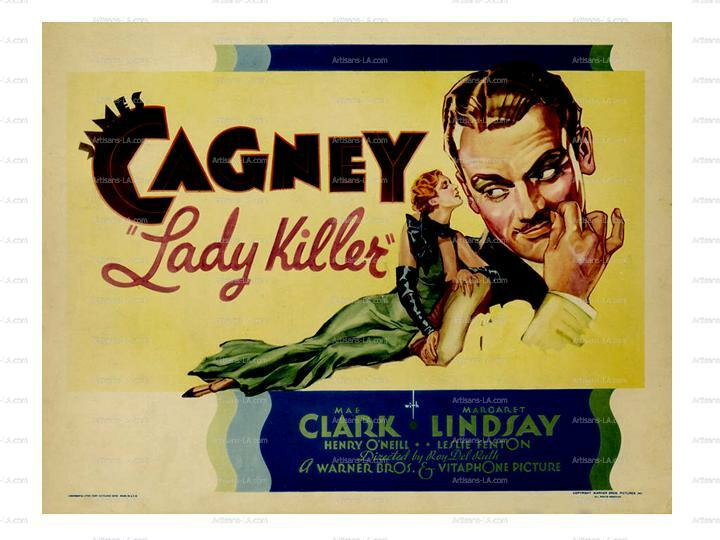 LADY KILLER was directed by Roy Del Ruth, who directed any number of interesting pre-Codes, including Cagney's BLONDE CRAZY (1931) and TAXI! (1932). Other notable Del Ruth pre-Codes include an early version of THE MALTESE FALCON (1931) with Ricardo Cortez, the terrific Lee Tracy comedy BLESSED EVENT (1932), EMPLOYEES' ENTRANCE (1933) with Warren William in a completely amoral leading role, and the highly entertaining BUREAU OF MISSING PERSONS (1933) starring Pat O'Brien and Bette Davis. Del Ruth directed through 1960; his later films included a favorite Doris Day movie, ON MOONLIGHT BAY (1951). 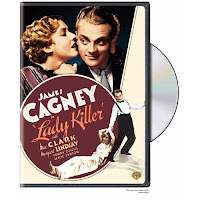 LADY KILLER can be purchased on DVD as a single title or as part of the Warner Gangsters Collection, Vol. 3. Extras include a commentary track by Drew Casper of the University of Southern California School of Cinematic Arts. The DVD can be rented from Netflix or ClassicFlix. It can be rented for streaming from Amazon Instant Video, and it's also been released on VHS. 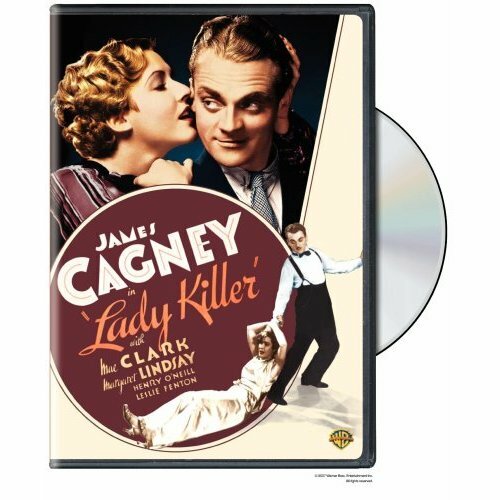 LADY KILLER can be seen on Turner Classic Movies. The trailer is at the TCM website. You are so right re The AA. I'm gone. First time ever. Don't know when the telecasts began, say 1949, I've never before left in the middle. Done. Too bad. It is about showmanship which seems absent. My family called me in to watch the memorial tributes -- I was appalled at the omissions of Harry Carey Jr., Ann Rutherford, Andy Griffith, and Tony Martin.